Click here to check out D3 React Map, an interactive data visualization project exploring police involved shootings in the United States. This project is an expansion of my an earlier app of mine, Police Involved Shootings in the United States: January 1, 2015 – July 9, 2016 (check it out below). This newer version – still in progress – takes the best pieces of its predecessor while overhauling the technical stack for better performance, responsiveness, and cross-device compatibility. The application explores police involved shootings in the United States, looking at breakdowns of shootings in aggregate, per capita, by state, by race, by date, and (coming soon) by gender, age, and armed status of victim. The ultimate goal is to uncover distinct, multivariate spatial patterns in police shootings and to present the data in a way that is accessible and intuitive for a broad user base. The application is built using React, Redux, redux-saga, yarn, Sass, redux-little-router, and Victory. Read more about the development process on my blog. Better yet, take a peak at the source on Github and give it a star while you're there. Click on here to get to The Road to Vision Zero: Traffic Crashes and Poverty in New York City. Click here to get to Police Involved Shootings in the United States: January 1, 2015 – July 9, 2016. Between January 1, 2015 and July 9, 2016, 1,715 people were killed by the police in the United States, amounting to an average of 3.1 people every day. This is a staggering statistic, nuanced further by the fact that trends in police involved shootings vary tremendously across dimensions of space, scale, time, and demography. This page, created using data from The Guardian's project The Counted and version 4 of D3, seeks to unpack a few of these patterns through a suite of data visualizations. Currently, shootings are examined as both raw counts and normalized counts by state, and aggregated by day and by month. Future expansion of this project plans to look at patterns across race, gender, age, and reason for shooting. There are also plans to integrate these visualizations with The Counted API to provide real time data updating. Check out the source code on Github or get in touch on the Contact page if you're interested in collaborating further on this project. For a higher resolution PDF of this map, click here. This layout, made as part of Middlebury College's 2016 Cartographic Design seminar, brings together several advanced cartographic techniques to tell a unique story about the indigenous communities of the southern Peruvian Andes. Working in collaboration with the Andean Alliance for Sustainable Development (AASD), I designed this layout to discuss the challenges these communities face with respect to agriculture and social service access. I also sought to highlight some of the ways AASD is helping local farmers to integrate their indigenous knowledge with high altitude growing practices to create a more stable agricultural system in the region. The shaded relief I created for this layout draws inspiration from the work of two marvelous cartographers – Eduard Imhof and Tom Patterson. Imhof's work, particularly his thoughts on slope illumination and aerial perspective, formed the design basis for this piece. Patterson's shaded relief tutorials were my technical guides to achieving these effects – and quite wonderful guides they were. For further inquires about this map, please get in touch on the Contact page – I'd be happy to provide more information on my design process. For more information on the Andean Alliance for Sustainable Development, visit their website. For higher resolution PDFs of these maps, click on the images above. 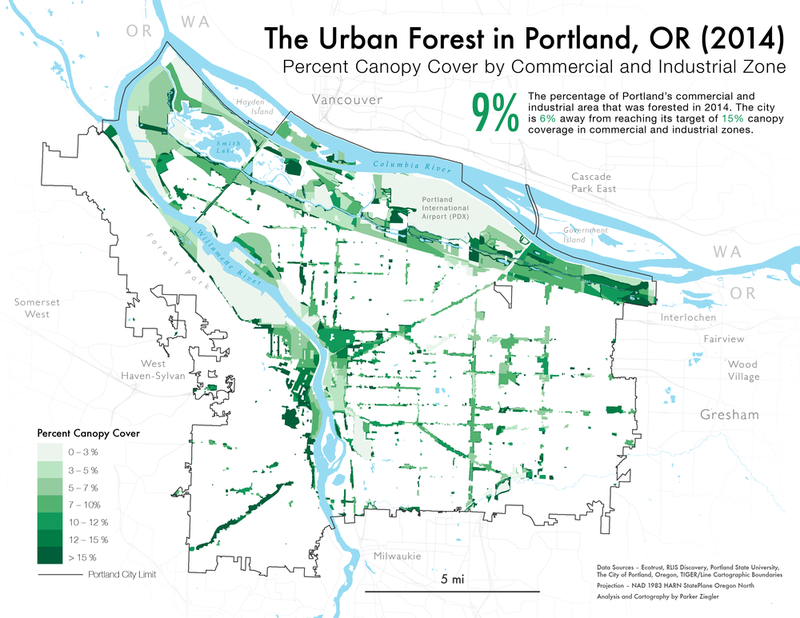 This set of maps, designed for Ecotrust and the Portland Urban Forestry Commission as part of Azavea's Summer of Maps fellowship, takes an in-depth look at the current state of Portland's urban canopy. The maps in this series fall into two main sets. 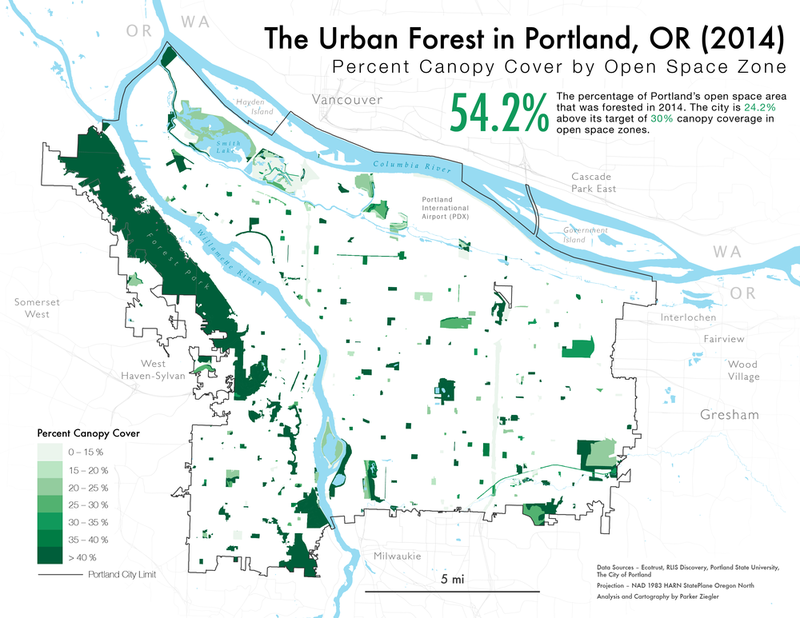 The first set shows the percent canopy cover of each areal unit of interest in Portland, including neighborhoods, Census block groups, residential zones, commercial and industrial zones, and open space zones. The second set focuses on the proximity of each areal unit to target canopy goals set in the 2004 Urban Forestry Management Plan, helping to identify areas of the city that remain substantially underforested. Above, Portland's urban forest as captured by 1m LiDAR in 2014. Maps were generated using ArcGIS and final cartographic work was performed in Adobe Illustrator. To get a more holistic sense of this project, check out the project description on Azavea's website or take a look at the final presentation I gave to the folks at Ecotrust and the Portland Urban Forestry Commission. Special thanks to Esther Needham, Data Analytics Project Manager at Azavea, for her mentorship on this project. 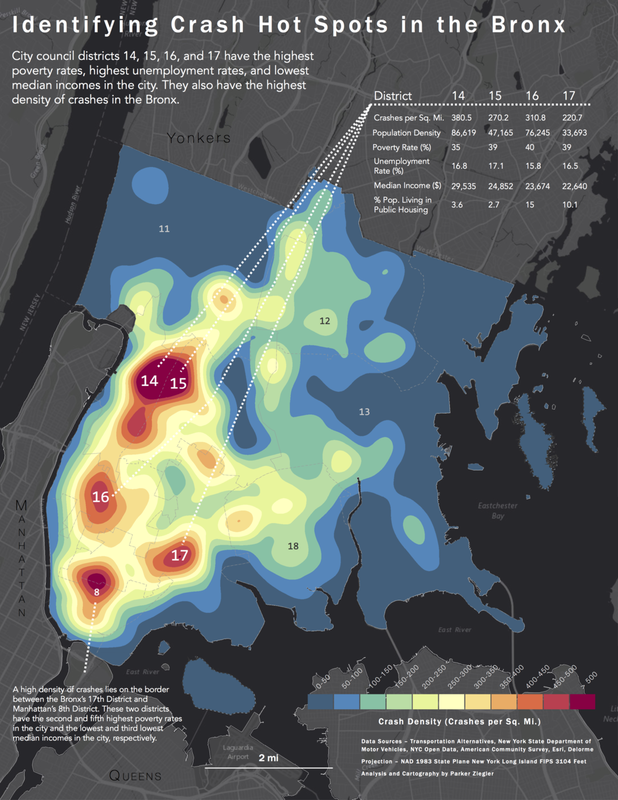 This set of maps, designed for Transportation Alternatives as part of Azavea's Summer of Maps fellowship, seeks to 1) identify clusters of traffic crashes in New York City between 2013 and 2015 and 2) theorize relationships between the density of crashes and local measures of poverty. The results of this spatial analysis show a clear trend – areas with higher concentrations of traffic crashes tend to have higher poverty rates, lower median incomes, and be more densely populated. The above collection includes a citywide analysis with economic profiles of each borough alongside analysis of vulnerable city council districts within each borough. In addition to these maps, the project has involved developing a multivariate regression model to theorize crash causality, writing a policy report with integrated graphics and statistics, and developing an interactive web application built on CARTO and D3. To get a more holistic sense of this project, check out the project description on Azavea's website or take a look at the final presentation I gave to the folks at Transportation Alternatives. Special thanks to Daniel McGlone, Senior GIS Analyst at Azavea, for his mentorship on this project. For higher resolution PDFs of these layouts, click here (for change detection analysis) and here (for geographically weighted regression). These two layouts, designed for Ecotrust and the Portland Urban Forestry Commission as part of Azavea's Summer of Maps fellowship, help to tell two fascinating stories about Portland's urban forest. The first – a result of high resolution change detection analysis using a combination of LiDAR and NAIP multispectral imagery –visualizes how Portland's urban forest has evolved at multiple geographic and temporal scales. 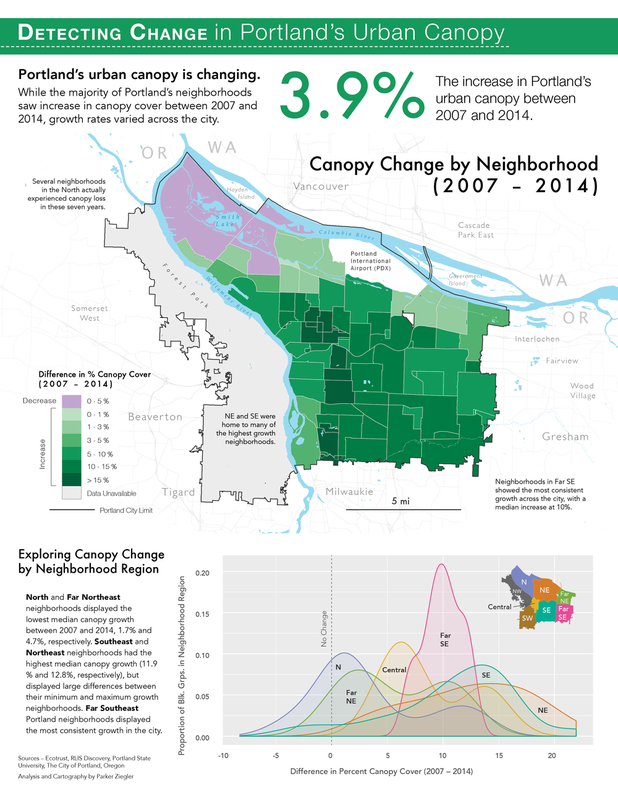 The second – a result of geographically weighted regression – attempts to pinpoint some of the main drivers and correlates of canopy distribution, including race, education, home ownership, and population density. 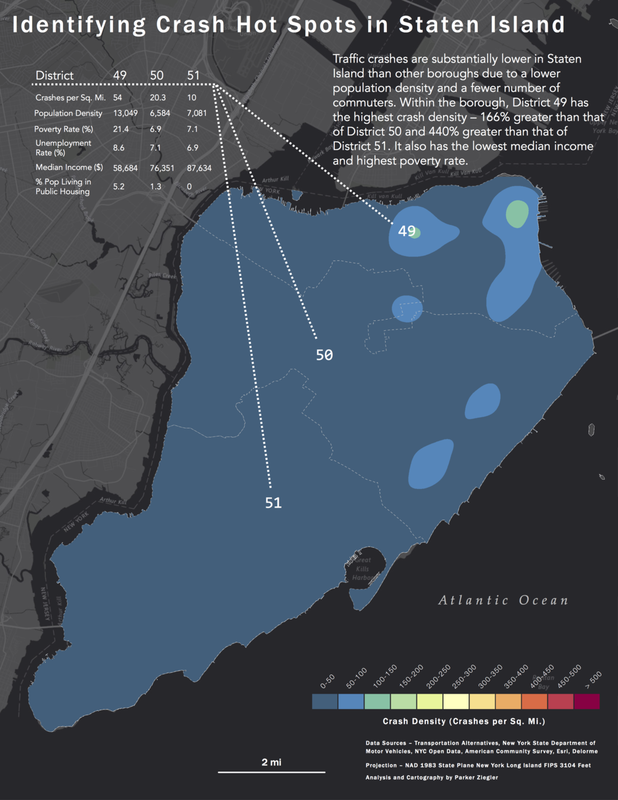 Maps were generated using ArcGIS, graphics were generated using the R statistical programming language, both were polished in Adobe Illustrator, and the layouts designed in Adobe InDesign. For a higher resolution PDF of this report, click here. 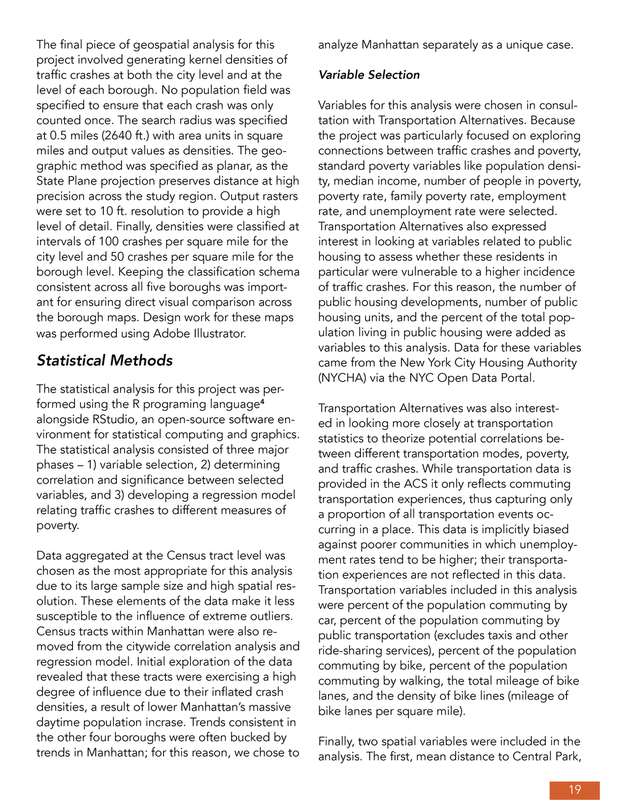 This report, written and designed for Transportation Alternatives as part of Azavea's Summer of Maps fellowship, provides an in depth summary of the statistical and geospatial analysis conducted to explore relationships between traffic crashes and poverty in New York City. The report seeks to integrate multiple ways of looking at the data to meet the needs of multiple users. Statisticians will find the correlation matrices and regression diagnostic plots particularly interesting. My fellow map nerds will enjoy the kernel density maps pictured throughout (and at left). 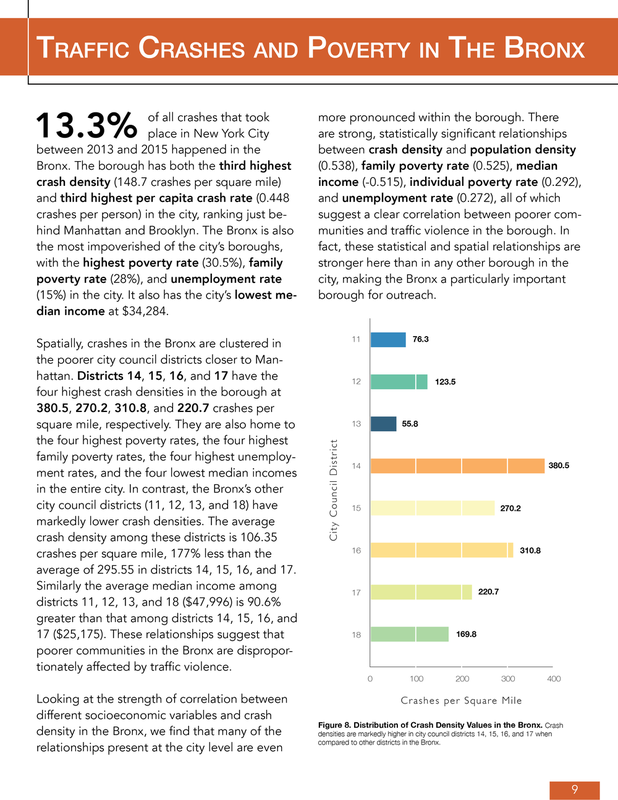 My ultimate hope, however, is that anyone can approach this report and uncover the complex connections between traffic crashes and poverty across New York City. The statistical analysis for this project – including correlation analysis, OLS regression, negative binomial regression, and regression diagnostics – was performed using the R statistical programming language. Similarly, the graphics included in this report were generated using R's car, corrplot, and ggplot2 packages, with final design work done in Adobe Illustrator. To access the full R script used for this project, check out the source code on Github. The geospatial analysis for this project was conducted using ArcGIS, with final maps designed in Adobe Illustrator. The report provides an executive summary, a discussion of key trends at the citywide level, a discussion of the statistical and geospatial dynamics within each borough, directions for future research, and an extensive methodology section. The report will be released this fall in phases by Transportation Alternatives. This layout, created as part of Middlebury College's 2016 Cartographic Design seminar, takes a look at the migration of unaccompanied children from the Central American countries of Honduras, El Salvador, and Guatemala to the United States. In 2014, the number of unaccompanied child migrants attempting to make the passage into the U.S. hit a critical spike, pushing President Obama to call the crisis a "humanitarian situation." In this layout, I explore three different geographies of the child migration stream. The first map shows the number of child migrants apprehended along each sector of the U.S. – Mexico border in 2014, with orange lines representing the number of child migrants attempting to cross the border and red lines representing the number of U.S. Customs and Border Protection (CBP) staff. The second map zooms in to the border crossing at the Rio Grande Valley, where 73% of apprehended child migrants attempted the passage. The third map shows the actual migration paths these children take from their homes in Central America to reach the border. The graphics help to illustrate where these child migrants are coming from, as well as the fluctuations in migration patterns from 2013 to 2015. My hope with this layout is to tell a compelling, honest story about the child refugees on our doorstep. In attempting to do so, I also acknowledge the incompleteness of this story, and the many ways in which this layout fails to represent the lived experiences of the many children who attempt this dangerous journey. These maps are dedicated to them. This map, designed as part of the application process for Azavea's 2016 Summer of Maps fellowship, takes a look at access to healthy corner stores in Philadelphia. Broken down by Census tracts, I used a combination of distance and quality metrics to pick out those tracts that are already well-served by healthy corner stores and those that are severely underserved. I then aggregated these metrics in a weighted access index to better quantify the data. As a community resource, healthy corner stores increase residents' access to fresh, local, and sustainable food sources. To learn more about Philadelphia's Healthy Corner Store Initiative, click here. Click on the image above to access this map on one of my Github pages. This map, created in partnership with Professor Joseph Holler of Middlebury College, was designed for the Zuni Youth Enrichment Project (ZYEP) to serve as a community resource for the town of Zuni Pueblo. Using Leaflet.js, Joe and I coded this map to show local trails, playgrounds, community landmarks, schools, hospitals, bike paths, and more. The hope is that this resource can help folks in Zuni access and use these community resources to live a healthier lifestyle To learn more about how this map was made, and to see the code behind it, head over to my Senior Research page. To access a higher resolution PDF of this map, click here. Using this metric, as well as the cartographic concept of small multiples, we're able to show how responses to the convict leasing system varied both spatially and temporally. The captions help to explain why these spatial and temporal changes in newspaper sentiment occurred. This second map, also created for the thesis of Ben Clark '16, takes a look at another important narrative embedded within debates over the convict leasing system – convict mutinies. In camps across the state, convicts banded together to rebel in ways both trivial and significant. However, these mutinies were not spatially homogenous. As this map shows, most mutinies were concentrated in the northwestern part of the state. Moreover, these mutinies varied in their relative intensity with some involving only a few convicts while others included nearly half the camp. Notice as well that some convict mutinies occurred beyond Georgia state lines – these correspond to uprisings organized by Georgian convicts laboring outside of the state. This fact also demonstrates that the economy of the leasing system was not limited to Georgia but extended to other neighboring southern states. The graduated circles in this layout correspond to a convict mutiny intensity metric that Ben crafted after reading hundreds of newspaper articles and penitentiary documents discussing the mutinies. The metric is based on the total number of convicts involved in the mutiny, the duration of the mutiny, and the ratio of the number of convicts involved compared to the number of convicts in the camp. "Whose Crisis, Whose Famine?" was created in conjunction with a paper discussing the U.S. government's framing of the 2002 food emergency in Zambia. Taking a political ecology approach, I argue that the U.S. government and its associated aid organizations heavily exaggerated the extent of the 'famine' to justify food aid in the form of genetically modified (GM) maize. Moreover, Zambian resistance to aid came out of 1) a desire to protect Zambian crops from potential GM cross-pollination, and 2) a determination to deny entrance to multinational seed corporations. This map was created from SVG files layered and manipulated in Adobe Illustrator. Data for this map came from the United Nations Food and Agriculture Organization (UNFAO). Created for Middlebury College's 2013 Atlas of Environmental Change, "Racializing Space in Urban America" explores how social, economic, legislative, and geographic forces have shaped the racial geographies of American cities. In particular, the atlas plate considers how two specific case studies, the 1910 Segregation Ordinance in Baltimore and the phenomenon of redlining in Depression-era Philadelphia, represented key moments in an American history of racially-biased urban planning. Maps for this project were created using historical base layers georeferenced in ArcGIS Desktop and data from the U.S. Census Bureau and Social Explorer. Cartographic design was performed in Adobe Illustrator while the final plate layout was designed in Adobe InDesign. Click on the picture above to access this interactive map on one of my Github pages. This map, my first foray into the world of interactive and web-based cartography, combines multiple visualizations to shed light on the geography of eviction in San Francisco, CA. Since the northward movement of Big Tech began in the early 2010s, low-income residents have increasingly been priced out and pushed out of their homes. In particular, neighborhoods like the Mission, the Sunset, the Castro, and the Haight-Ashbury have seen rapid and violent change, with extreme increases in home value prices and monthly rent. The Ellis Act, a piece of legislation giving businesses the unrestricted right to evict tenants in order to "go out of business," has given way to an arbitrary and aggressive regime of real estate speculation backed by big capital. For more information on San Francisco's eviction epidemic, check out the Anti-Eviction Mapping Project. Data for this map came courtesy of SF Open Data and the U.S. Census Bureau. To learn more about how this map was made and designed – and to access the code working behind it – check out my Senior Research page. 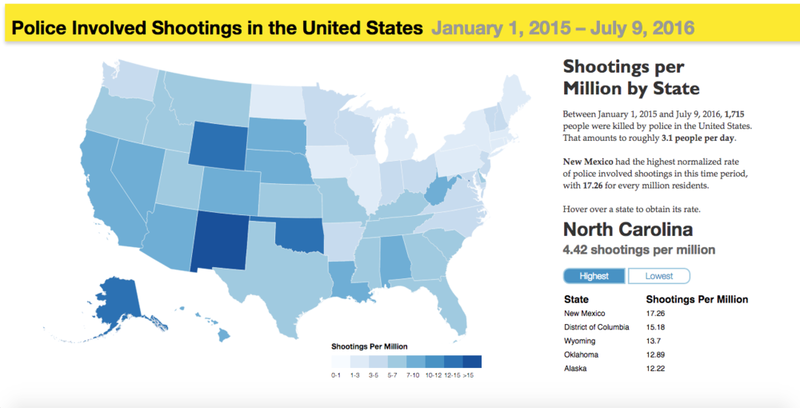 This map takes a sobering, multi-scalar look at gun violence in the United States. Focusing specifically on mass shootings in the period from December 2014 through October 2015, I used two separate methods – a choropleth representation and graduated circles – to look at how gun violence breaks down at the state level and at the level of house districts. The choropleth map shows the number of people killed or injured per capita in each state. The graduated circles on the map represent the raw number of people killed or injured in mass shootings in each house district, with larger circles indicating more casualties. These circles are geolocated using the centroid of the house district in which the shooting took place, and then color coded to show whether the house district is Republican or Democrat. I think this serves as a striking visual method for showing who represents the victims of gun violence at the federal level. In putting this map online, I want to acknowledge a few important things. First, Professor Jeff Howarth in the Middlebury College Department of Geography developed the original workflow and cleaned the datasets used in this map. I adapted his workflow, which was originally designed for ArcGIS, for use in the open source QGIS. This introduced several challenges and forced a few creative workarounds to get the same functionality, but I am really happy with the results. Second, I want to convey how emotionally difficult it is to make a map like this. Too often when we make maps, we forget the gravity of the data we are working with. These circles and polygons represent real people, with real lives, who died at the hands of gun violence. And attempting to represent those people, those stories, and the heartbreak of those communities is something this map fails to do. This map, which takes its cue from Bill Rankin's dot density map of Chicago, takes a look at the spatial relationship between race and arrest density for possession of three different drugs – marijuana, powder cocaine, and crack cocaine – in Chicago, Illinois. Similar to Rankin's map, I used a dot density style to show the racial segregation of the city; however, I altered the value of each dot to represent 250 people, rather than the 25 people per dot value used by Rankin. This allowed the choropleth layer underneath to come through. The choropleth layer represents an arrest density for possession of the highlighted drug for the month of October 2015, as reported by the Chicago Police Department. I spatially aggregated the crime data by the Chicago Police Department's police beats using a method known as areal weighted reaggregation (AWR). This allows us to see the police beats in which arrests for possession of these different drugs are particularly high. The South and West Side appear to experience the most aggressive policing for possession of marijuana and crack cocaine, while transitional border areas between Latino and white communities are more heavy policed for powder cocaine possession. In general, it is startling to see how closely higher policing rates are spatially correlated with communities of color. Indeed, the data provide convincing evidence that racial profiling still informs how the state thinks about drugs, policing, and whose behavior is considered 'criminal'. I believe it is important to give credit where credit is due, and I want to recognize Professor Jeff Howarth for developing the original GIS workflow to make this map. Following his lead, I made several alterations and decisions of my own (with respect to normalization, symbology, drugs studied, cartographic design, and operation parameters) to make these maps uniquely my own. To get the data and begin mapping for yourself, head over to the extensive Chicago Data Portal. Using Network Analyst in ArcGIS Desktop, I made this continuous raster showing the differential access of residents in Vermont's Northeast Kingdom to a variety of healthcare services. Separate service areas were created for hospitals, primary care facilities, and specialized care facilities, and then combined to produce a single raster representing access via the "Healthcare Accessibility Index" (see map). In particular, residents of the isolated towns of Avery's Gorge, Lewis, and East Haven are in need of new healthcare facilities, while those in St. Johnsbury, Derby, and Newport have ready access. This map takes a detailed look at the British Bangladeshi diaspora in the London borough of Tower Hamlets. Representing the largest population of Bangladeshis outside of Bangladesh, the diaspora in Tower Hamlets has begun to exercise increased political influence in the U.K. However, the rise of political Islam has also produced conflict within the community, particularly between those who identify with the mother country and others who identify with the global Muslim umma. Using data from the 2001 and 2011 Tower Hamlets Census, I layered and manipulated several SVG files in Adobe Illustrator to produce this choropleth population map. This map reveals the complex geopolitics at the heart of the Taq Taq–Ceyhan oil pipeline. Opened in early 2014, the pipeline connected Iraqi Kurdistan's oil-rich Taq Taq field with the Turkish port town of Ceyhan. Initially, all profits were supposed to be allocated to the Kurdistan Regional Government (KRG) in Iraqi Kurdistan. However, Baghdad charged that the pipeline constituted an infringement on Iraqi resource sovereignty and threatened armed intervention. Recent conflict with the Islamic State (ISIS) has further complicated the issue of resource ownership in the oil fields of northern Iraq. This map was created using SVG files layered and manipulated in Adobe Illustrator.